Alright, let's just get straight to the point. We're all women here, right? We all get that monthly visitor that shows up, and you need to be prepared. Being caught off guard or without period supplies can be such a drag, and can completely ruin your day (or week). Keeping a "Cycle Survival Kit" stocked with my favorite Kotex® products and other helpful items is a must! My period has been out of commission for a little while now since I was pregnant and am now breastfeeding. However, just a few weeks ago, a little surprise showed up out of nowhere, catching me completely off guard. 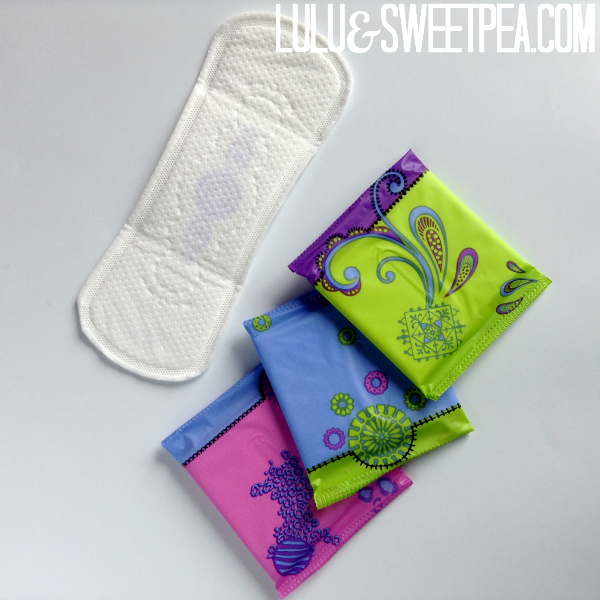 I had no tampons or pads anywhere in the house- why would I? I didn't need them for the last 18 months! A shopping trip to Walgreens was definitely in order. 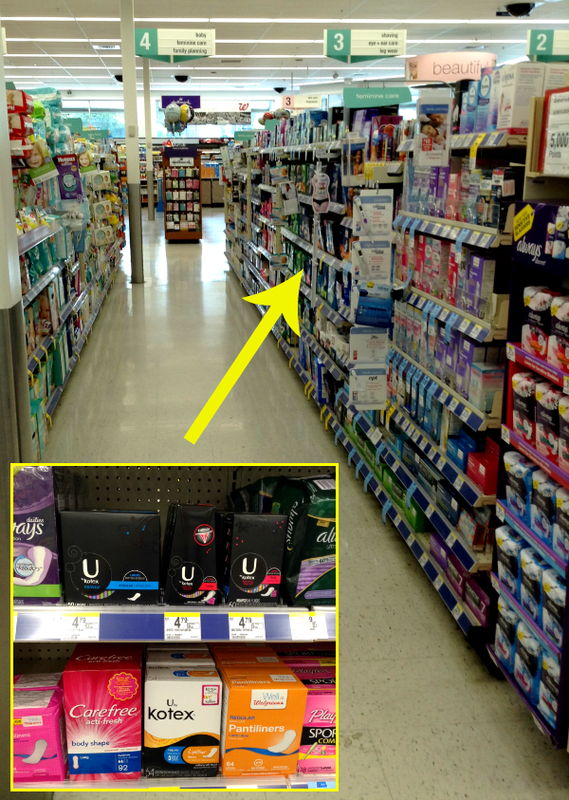 I headed straight for feminine care/family planning aisle (which is also the baby aisle at my local Walgreens). I found what I needed quickly and easily. In addition to my favorite Kotex® tampons, I also grabbed their new U by Kotex® Curves® Liners and U by Kotex® Lightdays® Liners for some backup support. Kotex® is definitely my go-to brand, so I knew I could trust these liners. They feature new technology in their pads so I feel more confident wearing whatever I want! I especially love their Cleanwear® cover because it's not only soft and comfortable, but it also protects my undies against leaks. While chasing around 3 kids and wrangling a squirmy baby, that's the last thing I want to worry about. Kotex® has me covered! Isn't the packaging adorable? I love the fun prints. After grabbing my Kotex® period supplies, I decided to stock up on everything else I'd need to survive this first postpartum period. 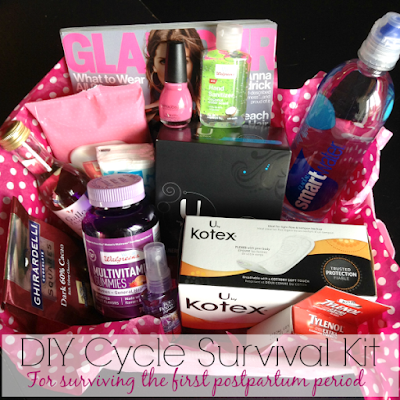 I put together my survival kit for myself, and how cute would it be to whip up a little kit for a new mom friend? Most people just think about the baby after a woman gives birth, but the mom needs some help and support too! What a great way to look out for a friend and show her you're thinking of her, in addition to her new little bundle of joy. 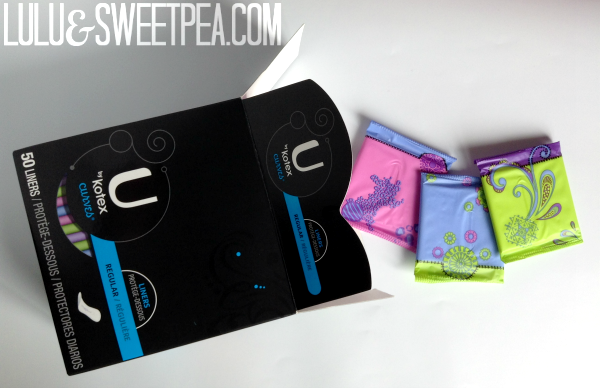 U by Kotex® Curves® & U by Kotex® Lightdays® Liners- for obvious reasons! Tylenol- for cramps, back aches, etc. It's also safe for nursing moms. Water- to stay hydrated (also helps with cramps/fatigue, & for breastfeeding). Magazine- for when you need to put your feet up and relax for a minute or two. Hand sanitizer- for quick trips to the bathroom. Feminine cleansing cloths- because, well, you know. Multivitamins- to stay healthy & maintain energy (especially helpful if breastfeeding). Tissues- for when hormones attack. Nail polish- it may have been a while since you've been able to see or reach your toenails! Body spray- when you need to feel fresh. Dark chocolate- when you need something sweet, dark chocolate is a nice treat. 1. Get your supplies. In this case, it's just a box of rice and one sock. It can be any kind of rice and any size of sock- it's up to you! 2. Stretch out the sock, and then carefully fill it about 3/4 of the way full. You may want to use a funnel for this, otherwise you might spill rice everywhere like I did. 3. Carefully tie the open end of the sock so that no rice can escape. 4. 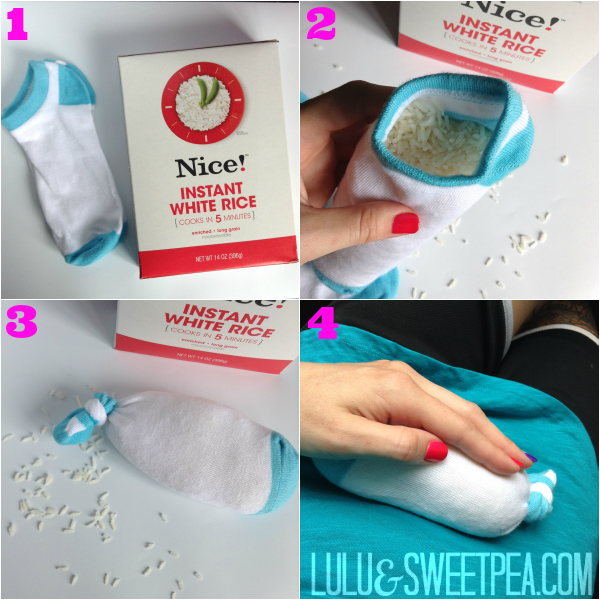 Microwave the rice sock for about a minute (depending on how hot you want it- be careful!) Place on your abdomen or lower back for warm relief from cramps, backaches, etc. Need to stock up on some Kotex® supplies? Make sure to head over to the Ibotta Rebate Smartphone App to get $0.75 off Lightdays® Liners and Curves® or Barely There® Liners. You can also get more Cycle Survival inspiration HERE. Who would you make a Cycle Survival kit for? What would you include in yours to personalize it or make it extra special? I'd love to hear your creative ideas!